Novoxen 500: Each tablet contains Naproxen BP 500 mg and Esomeprazole USP 20 mg. It is indicated for the relief of signs and symptoms of osteoarthritis, rheumatoid arthritis and ankylosing spondylitis and to decrease the risk of developing gastric ulcers in patients at risk of developing NSAID-associated gastric ulcers. Novoxen is not recommended for initial treatment of acute pain because the absorption of Naproxen is delayed compared to absorption from other Naproxen-containing products. Novoxen is contraindicated in patients with known hypersensitivity to Naproxen, Esomeprazole Magnesium. Novoxen is contraindicated in patients who have experienced asthma, urticaria or allergic-type reactions after taking aspirin or other NSAIDs. Rheumatoid Arthritis, Osteoarthritis and Ankylosing Spondylitis: The dosage is one tablet twice daily. The tablets are to be swallowed whole with liquid. Do not split, chew, crush or dissolve the tablet. Novoxen is to be taken at least 30 minutes before meals. Most common adverse reactions in clinical trials (>5%) are erosive gastritis, dyspepsia, gastritis, diarrhea, gastric ulcer, upper abdominal pain and nausea. Cardiovascular: Clinical trials of several COX-2 selective and nonselective NSAIDs of up to three years duration have shown an increased risk of serious cardiovascular (CV) thrombotic events, myocardial infarction, and stroke, which can be fatal. All NSAIDs, both COX-2 selective and nonselective, may have a similar risk. Hypertension: NSAIDs, including Naproxen, can lead to onset of new hypertension or worsening of pre-existing hypertension. Congestive Heart Failure and Edema: Fluid retention, edema, and peripheral edema have been observed in some patients taking NSAIDs and should be used with caution in patients with fluid retention or heart failure. Gastrointestinal: NSAIDs, including Naproxen, can cause serious gastrointestinal (GI) adverse events including inflammation, bleeding, ulceration, and perforation of the stomach, small intestine, or large intestine, which can be fatal. While Naproxen and Esomeprazole combination has been shown to significantly decrease the occurrence of gastric ulcers compared to Naproxen alone, ulceration and associated complications can still occur. Renal Effects: Long-term administration of NSAIDs has resulted in renal papillary necrosis and other renal injury. Pregnancy: Pregnancy category C. Novoxen should not be used in late pregnancy.Hepatic Insufficiency: Novoxen is not recommended in patients with severe hepatic insufficiency. Pediatric Patients: The safety and efficacy of Novoxen in children younger than 18 years has not been established. Novoxen is therefore not recommended for use in children. Concomitant use of NSAIDs may reduce the antihypertensive effect of ACE inhibitors, diuretics and beta-blockers. Concomitant use of Novoxen with methothrexate may increase the toxicity of methotrexate. Concomitant use of Novoxen and warfarin may result in increased risk of bleeding complications. Esomeprazole inhibits gastric acid secretion and may interfere with the absorption of drugs where gastric pH is an important determinant of bioavailability. 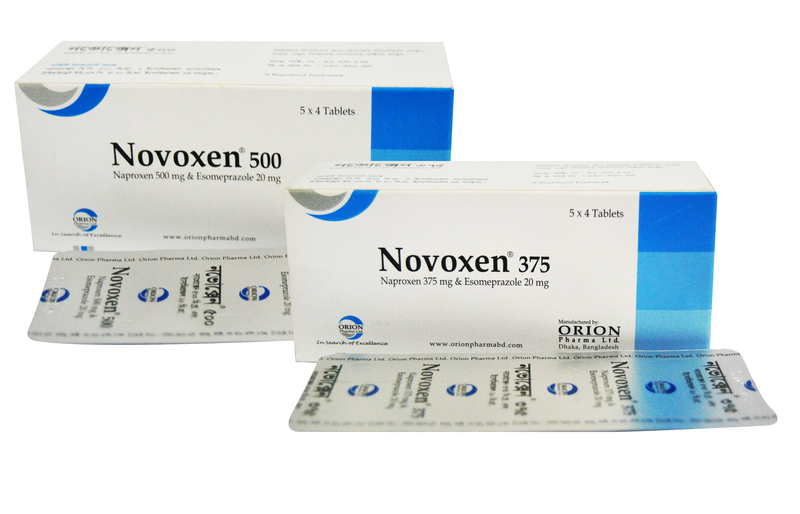 Novoxen 500: Each box contains 5X4 Tablets in blister strips.